This CD is the product of a process that started with the CD 0.000 by the Japanese artist Nosei Sakata (*0), a CD which contains basically nothing (i.e. sound outside the human hearing range). Sakata asked other artists — among them Marc Behrens — to remix, reinterpret this material which was then released on a double CD called *0-0.000remix — Inflation. The idea was to create everything from nothing. When Behrens received his promo copies he decided to take the process further, partly to creatively transform his fury about the outrageous customs bill: he used material from the reinterpretation pieces by Taylor Deupree, Hsi-Chuang Cheng, Aube, Richard Chartier, Akira Rabelais, John Hudak, Bernhard Günter and Steve Roden to construct a further reinterpretation. After the completion of this piece, Paulo Raposo and Behrens, already collaborating on the design for the portuguese label sirr.ecords, decided to work together in music as well. 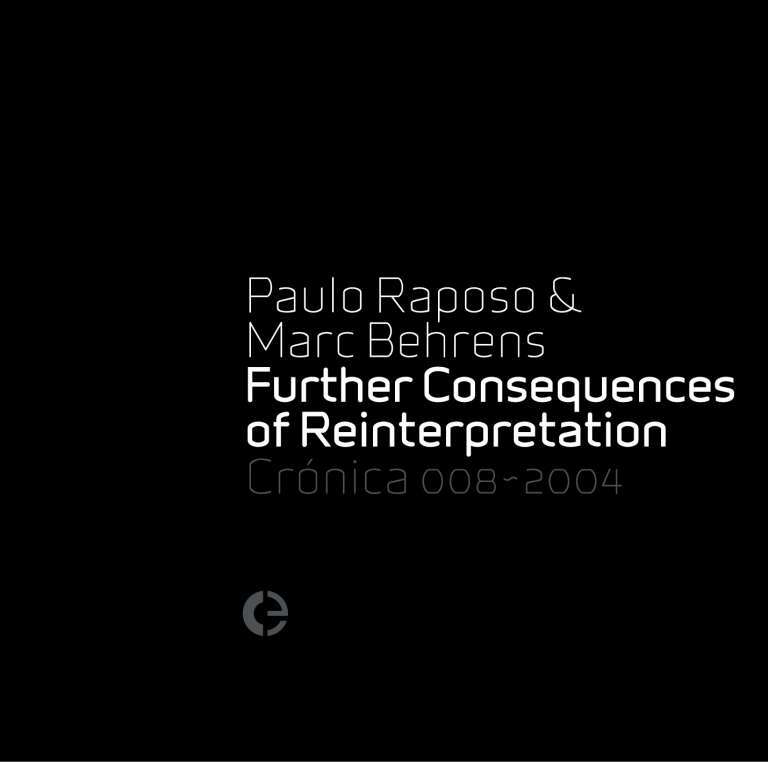 Thus Raposo, who received the sound material in the form of all the single sounds used in the piece by Behrens, himself composed another reinterpretation. Raposo and Behrens use different methods to compose, as well as different structural approaches, and premiered both their — however complimentary — pieces in the form of a friendly audio duel (like a ping pong match) on March 21, 2003 in the auditorium of the Goethe-Institut Inter Nationes in Lisbon. The show was entitled Further Consequences of Reinterpretation. Recorded between Spring 2002 and Spring 2003 in Frankfurt a.M./Germany, Grimacco (UD)/Italy, and Lisboa/Portugal, except track IDs 1 and 14 recorded May–June 2001, track ID 1 released as >0 on *0-0.000remix — Inflation (Mu-Label, Japan).